One of our favorite things about Oscar lately is his Mohawk. 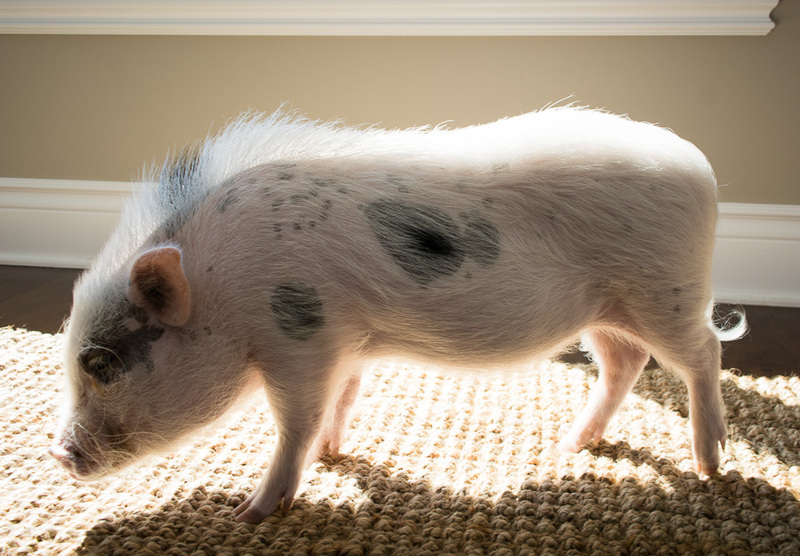 Mini pigs have a strip of hair on top of their back called their Mohawk, and they raise and lower their Mohawks throughout the day for a few different reasons. The first reason Oscar raises his Mohawk is due to contentment. When Oscar gets a back scratch or a belly rub, the hairs of his Mohawk stand up. If I walk up to Oscar and start scratching him, I can actually watch his Mohawk slowly rise. I love it because it lets me know that Oscar is really enjoying his back scratch or belly rub, and I love knowing he’s happy. 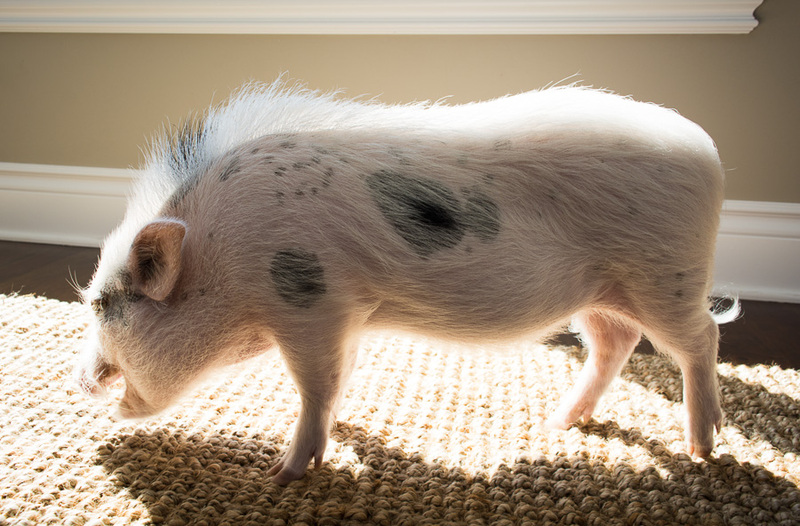 The other reason a mini pig’s Mohawk stands up is due to aggression or fear. Pigs are prey animals, so their Mohawks give them protection by allowing them to appear larger to other animals when they are approached or challenged. It’s a really interesting form of protection, and knowing about this has helped me better understand Oscar’s state of mind. As I discussed in a previous post, Oscar and our dog, Rylee, occasionally challenge and snip at each other. Most of the time, it’s a quick snip and then they both move on. Every once in a while though, Oscar tries to instigate a more serious challenge. I’ve learned that I can usually tell by his Mohawk how aggressive he’s feeling toward Rylee, and that lets me know I need to stop what I’m doing and really pay attention to their interaction. I try to let Oscar and Rylee work things out between themselves because intervening seems to make things worse in the long run. Now though, I check to see if Oscar’s Mohawk is standing straight up when he engages Rylee in a challenge. If it is, I know to be prepared to step in since things could escalate more quickly. Here is a video of Oscar’s Mohawk rising during a back scratch. We are really enjoying Oscar’s Mohawk lately. It’s fun to watch his Mohawk hairs rise when he’s getting a back scratch or belly rub, and it’s also a great communication tool for when he’s feeling aggressive or fearful. Since mini pig raise their Mohawks for both contentment and aggression, it can be confusing at first to understand what your pig is communicating. However, once you get to know your pig, it becomes very easy to figure out what your pig is communicating through his Mohawk, making it a great tool for better understanding your pig and his state of mind. Oscar is underweight. He looks sick. Many people are taught to starve their pigs to keep them small. You many have gotten the wrong information from your breeder. Underfeeding can cause organ damage and premature death. If Oscar had special need excuse my comment, I apologize. He looks sickly. Not healthy. If your vet thinks he looks ok, find another vet. Hey, I just got a mini pig about 4 days ago, he is 6 weeks old and such a sweet heart. I have had some problems with him eating his mini pig pellets, I have got him to eat grapes and some breed but he still don’t want to eat his mini pig food.. do you have any advice on how to get him to eat his pellets?